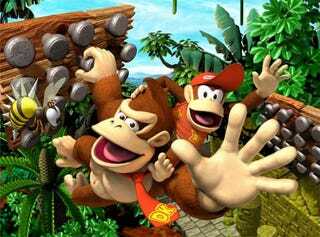 So, most of you probably don't know this, but it was Donkey Kong Country Returns for the Wii that sparked the original Uezielog and my vow to play every physical game release I own. I had purchased the game at full price and then proceeded to play all of one world before shuffling off to my random choices and whatever else had just come out and a bit later, it struck me how wasteful that was and so the destruction of the backlog began. And now here we are with DKCR 3D. It's an odd feeling to replay the game that started the journey two and a half years ago (started January 2011 so that's pretty exact actually). It's still a phenomenal game as I push through, up to World 5 at the moment, all KONG letters collected so far, the 4 K levels I have access to have gone down and I look forward to seeing the new levels after the dreaded Golden Temple. That said, I'm actually more excited for the upcoming titles and things happening. Remember Me should show up on Friday/Saturday and my plan is to marathon it immediately. Its divisive reviews have only strengthened my desire to play it. Beyond that is Last of Us, which I will also marathon immediately and I am ignoring any and all comments/articles about it as I want it to be truly fresh to me. I'm actually kind of annoyed that I know there are fungus looking zombies in the game. Just after that though, we have my marathon. The 72 Hour Gaming Marathon of Love, June 16th-18th. It's all me, all the time, except for my scheduled breaks and while I'll probably go quiet during certain games (Policenauts specifically since it's voice acted), I'll be there with chat the whole way otherwise. Honestly I don't expect to have that many people watching but who knows. It'll be at twitch.tv/eggmanimn and the schedule is at RIGHT HERE if anyone cares to see. The idea of the marathon is to explore why I and everyone love gaming. To really show the joy out there, to show people games that I've enjoyed in the past and have great love for and to even try out some games I've never played but have always wanted to play. And I'd like chat (whoever may show up) to talk about what they love about gaming too. There has been far too much negativity in gaming and I'd like to try to change that as much as I can. There's still so much to love. Oh yeah, I also finished Grid 2.